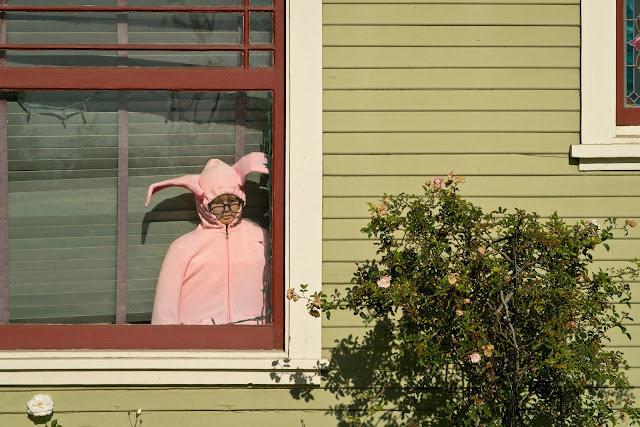 Anyone who is a fan of the movie, A Christmas Story, will immediately recognize Aunt Clara's gift to Raphie, the pink bunny suit. As Mr. Parker descibes it, "He looks like a demented Easter Bunny." This picture was taken here in my hometown; someone's ode to A Christmas Story for passersby to enjoy. Evidently, their are a few other fanatic folks around here familiar with the film. If you've never seen the movie, why not? Read about it here. By the way, this is a luddite's journal's 100th post.